Your Cloud Appointments customer data can be used to publicise your services & products and increase revenue ! You’ll first need to decide how you’re going to contact your potential customers. For a Texts publicity campaign we recommend a system called ezitxt otherwise we recommend MailChimp. Both have a free sign-up option so it’s worth getting a free account and exploring their software. Then when you start planning your publicity campaign you’ll know what’s possible. Whichever type of campaign and software you’ll be using you’ll need a list of customers to upload into the campaign manager software. 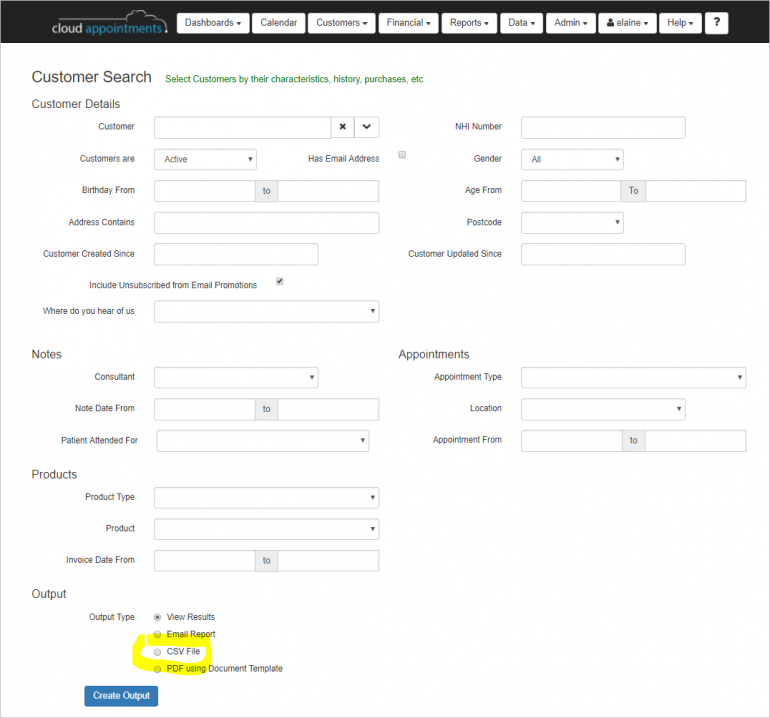 Select the customers you want to target by their specifying the selection criteria. Choose the CSV File option and click Create Output. A csv file will be created in your Downloads directory. Both the EziTxt and MailChimp allow you to import and upload a list of customers as subscribers / contacts. On the main dashboard click on the top Import option then click ‘Import a new file’. Add the additional fields before uploading the csv file. Click on the Help Search icon (top right screen corner) on ‘Import Subscribers to a list’ and it’ll provide a detailed explanation. Both the EziTxt and MailChimp software systems have built-in help. MailChimp : Click on the Help button at the top right of the screen and search within the available articles. There’s online help in both systems as to how to organise your publicity campaign and what types of campaign are available. Sending out ‘unsolicited commercial electronic messages’ in New Zealand and Australia is illegal. Have a look at the following web pages so you have an idea of your responsibilities. Both EziTxt and MailChimp software systems take into account these legal requirements. Your main responsibility will be when a customer requests to opt out of further publicity then you must remove them from your future publicity mailing lists. Otherwise you can be accused of illegal spamming. There are many campaign publicity manager packages available, we’ve only featured the two we know well. If you find packages you prefer then please let us know.